/ Top 3 of the Best Mantis Tiller Reviews: Find out Here! In this article, I’ve compiled the top three best Mantis Tiller reviews. Why? For the simple reason, that gardening should be a joyful and fun activity. Let me explain. Personally, I love the idea of making things grow, and even the melancholy if they don’t. However, maintaining a garden can be incredibly tiring. I first experienced fatigue when I used to sweep my lawn manually. Suddenly, caring for my lawn became a chore. That was until I used a lawn sweeper, then gardening became a joy again. Case in point, now, is when you’d manually cultivate the soil to prepare it before planting. It can be backbreaking work to repeatedly use a rake or a heavy mattock to loosen up the soil. Enter the rototiller. I’ve mentioned before that a rototiller allows you to do the work of five workers and even makes it possible to maintain a large garden by yourself! Indeed, a rototiller helped make caring for your soil fun again. Incidentally, you’ve probably seen Mantis Tillers in commercials or your local shopping network. Trust me when I say that the rototillers from Mantis are at the top of the industry. For this reason, I’ve reviewed three of their best tillers, at three different price points for your specific tillage needs. Below is a quick look the three best Mantis tiller reviews. In the Mantis Tiller reviews, you’ll notice that they don’t come cheap. They are, however, worth every penny, regardless of price point. Why? The answer is in the next section. Why exactly should I spend around $300 or more to loosen soil, you may ask. I had the same question and was equally skeptical about investing that much money in a Mantis Tiller. Nevertheless, when I learned about the advantages, I understood why. I was able to do loosen up my flower beds soil in 5 minutes. Remarkably, it usually takes me 30-40 minutes to manually cultivate this area. A Rototillers blades, or tines as it’s called, turns much faster than a conventional garden tiller. Hence, you will easily break up compact soil. They are perfect for raised flower beds, garden plots and creating furrows! Rototillers easily rip through the tough turf. If you’re still not convinced, just think of it again – 5 minutes for tilling with a motorized tiller. Work that usually takes 6-8 times longer when done manually! Plants, especially vegetables, need soft soil to grow and flourish. Cultivated soil prevents weed growth, lets air circulate through the soil, and allows water to reach roots. Yes, there are other brands that offer their tillers. However, Mantis is reputable and an established company of thirty-five years. Moreover, there first ever product was the tiller. What this means is their tillers are products of decades of development. Here, I’ve listed the strengths and weaknesses common among Mantis tillers. Hardened steel for superior durability. Their tillers are compact (only 9inches wide) for precise tilling. Precision helps you avoid obstacles as you cultivate. Tiller handles are height adjustable for maximum comfort. Handles also fold so storing them is a breeze. They’ll even fit in your car’s trunk because you’ll love these tillers so much you’d want to take them to your neighbors and cultivate their soil too! The power of Mantis Tillers rival that of their larger competition while staying very light. The patented Serpentine tines loosen the soil up to a foot deep. The tines are detachable and reversible. This feature allows you to create shallow 2-3 inch furrows in the soil. Also, the detachable blades make it very easy to clean and maintain. Precise speed control and a quick auto-off function. 5-year warranty on parts including the engine. One of Mantis’ best perks. What this means is that you can get and use a Mantis Tiller for three months. Afterward, if you’re not satisfied, you can send it back to Mantis, and they will give you a refund! Tiller Can be unstable and hard to control on very compact soil or when meeting sub-surface material such as roots, rocks, and garbage. Vibration in handles can cause heavy muscle fatigue through prolonged use. Note that these weaknesses are also present in other brands. These optional accessories make Mantis Tillers even more versatile and comfortable to use. You should consider getting them along with your mantis tiller. The kickstand allows your tiller to stand while inactive. The kickstand is most helpful when you take breaks as you won’t need to lie the tiller on the ground or find a wall to let it lean on. As its name suggests, the edger helps maintain the edges of your lawn or flower beds. What’s more, it gives you the manicured lawn look. These engine designs are also known as 2-stroke engines and 4-stroke engine. The name refers to the number of movements inside the engine, i.e. cycles or strokes, which directs a piston to make a complete revolution – one power cycle. Therefore, in a 2-cycle engine, a power cycle is completed in two strokes. On the other hand, it takes four strokes to complete a power cycle in a 4-cycle engine. You’re required to mix some oil with the gas. This mix creates a lot of emissions. The complex designs make it troubleshooting difficult. Equal or less power compared to a 2-cycle. This question arises from the controversy that tilling for the improvement of tilth might have the opposite effect – destroying the tilth of the soil. Furthermore, continuous soil agitation may create a hard layer beneath the loose soil. These claims are, in general, true but only through excessive tillage. Continuous improvement of tilth is possible through a combination of tillage, crop rotation, and cover crops. Mantis tillers need some assembly, taking around half an hour. Read through the unit’s manual. Make sure handles are at a comfortable height. Take care near fences, roots, and sprinklers. Take extra care that you or anyone else don’t go anywhere near the tines during operation. Stop tilling when weeds and roots have wrapped around the tines. Remove these to optimize your work. Wear gloves to decrease fatigue and irritation from prolonged use. Go slow when the tiller meets resistance from compact soil or subsurface material. Keep only enough fuel for a month’s use. You’ll want your tiller always to run smoothly. Keep it that way through proper cleaning and maintenance. Moreover, good maintenance prolongs your tillers’ life and keeps it efficient. Don’t leave fuel in the tiller for long periods of time, especially for 2-Cycle tillers. Here are two very helpful videos on Tiller maintenance and troubleshooting. You might want to bookmark these for future reference! The Mantis Deluxe 2-Cycle is the smallest, lightest, and most affordable of our three reviews. They’re great for smaller gardens with tight spaces between plants or flower beds. Gas and oil blending required for proper operation. The second on our Mantis lineup is a 4-cycle tiller with a Honda engine. This model is perfect for small to medium properties with bigger budgets. This tiller is certainly an investment, but one well worth it. Difficult with rocky soil and may halt operation. The biggest and most powerful of our Mantis Tillers. The Deluxe 4-cycle is a beast that will effectively, yet quietly take care of medium to large areas. Thus, this model is perfect for commercial lawn care business. Soft sure-grip handles for comfort, especially during prolonged use. Outer tines are detachable for a narrower spaces. 16-inch tilling width becomes 9 inches. Built-in front bumper for safety and kickstand. Most durable among the three reviewed tillers. 35 lbs may be heavy for some. There you go, dear reader! Three of Mantis’ top tillers for different budgets. Which one is the best? Always remember that the best is the one that will perfectly meet your needs and your gardens’ demands. 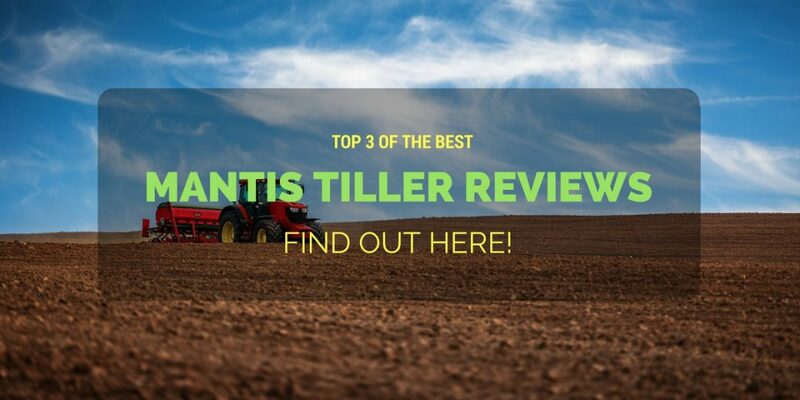 Whichever you choose, Mantis tiller reviews showed that they are worth every penny. Would you agree with our list? Leave us a comment if you do. Leave us a comment when you don’t and let us know what you think of our reviews!